There are a lot of great French press travel mugs these days. Some are more expensive than others and some make better coffee than others but can you just choose one based on price alone? If you are shopping in physical stores you probably don’t have much choice, these are products that are pretty hard to find in places other than with online retailers. Most of the options you find online are priced between $10 and $40 but even with this wide price range there are some good reasons to own the cheaper mugs as well and serious reasons to fork out for the premium models. I for one love the Zyliss french press coffee mug which I’ve listed below. You can also see pricing for the Zyliss here. It’s one of the cheapest mugs on the list but its perfect for making a simple cup of pressed coffee and taking it on the road to work. For outdoors activities however I wouldn’t think twice about leaving the Zyliss at home and taking the more expensive and durable Stanley travel press. Its more expensive but much better for camping or hiking. Of course for making perfect coffee, that would be a different portable coffee press. I’d probably go with the Espro Ultralight if I wanted to make the best coffee possible… although quality comes at a steeper price because the Ultralight is one of the most expensive options in this space. If you want more info on any of these three coffee maker travel mugs then read the following reviews. I’ve even included three additional options that may make even better sense for you. Now, there are quite a few models out there from quite a few different companies. Before you decide on one to buy you need to have a good idea as to how you are most likely to use your mug. Campers and outdoorsman of all sorts should stick with the pricier and more durable options reviewed below. Likewise, commuters, desk workers, and stay-at-home folk will likely gravitate to the options that are cheaper or built to make the best quality coffee possible. So, let’s now look at the best coffee press mugs of 2019. Espro is one of the names you simply must be aware about if you’re talking about coffee. It’s just that common in this market because of all the great products that it offers, so sooner or later, you’ll run into it. This can be proven by the fact that the first thing in this list is the Espro Coffee Travel Press. This aesthetically pleasing model provides you with a stainless steel body that makes it both durable and functional (when it comes to retaining temperature). These factors combine with the great brand name of this product to make this 12 ounce coffee travel press one of the best, according to all of the people who ever got the chance to use it. The Espro model is followed by the Bodum model. Incidentally, Bodum is also a really popular line of products with a lot of dedicated customers out there. The people who have used their products are willing to swear that those are among the best (if not THE best) that they have ever used. This specific model, for instance, has a stainless steel body, making it both aesthetically pleasing and durable. 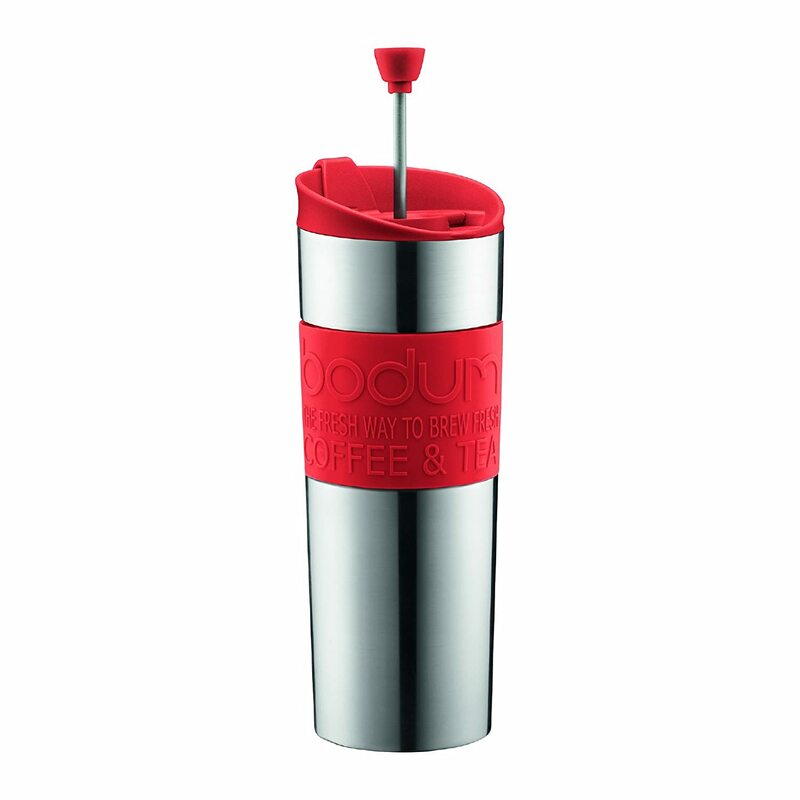 At the same time, it’s insulated to ensure that your coffee remains warm as long as you keep it in this mug. This 15 ounce container is one of those which you simply must consider. 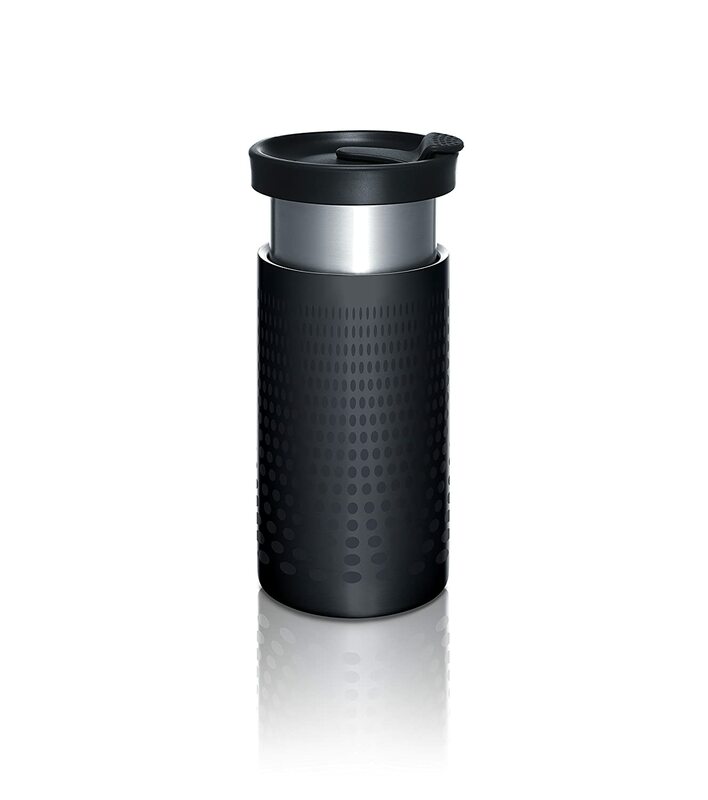 And then comes the Zell Vacuum Insulated French Press Mug! All the people who have used this model simply love it. In fact, some of them even venture to say that this is by far the best that they have ever had the chance to use. It’s undeniable that this model has a beautiful look to itself, but that’s not all that it boasts. This model also has vacuum insulation. Vacuum insulation is the best kind of insulation you can get for any mug because it ensures that the temperature is retained for the longest period of time. This mug boasts of a capacity of 12 ounces, which is just the right size for carrying around with ease. To sum it all up, this model has one of the largest fan bases out there for any single French press mug and that forces you to consider all the aspects of this model. And once you do that, you find out that this model actually deserves all that praise. 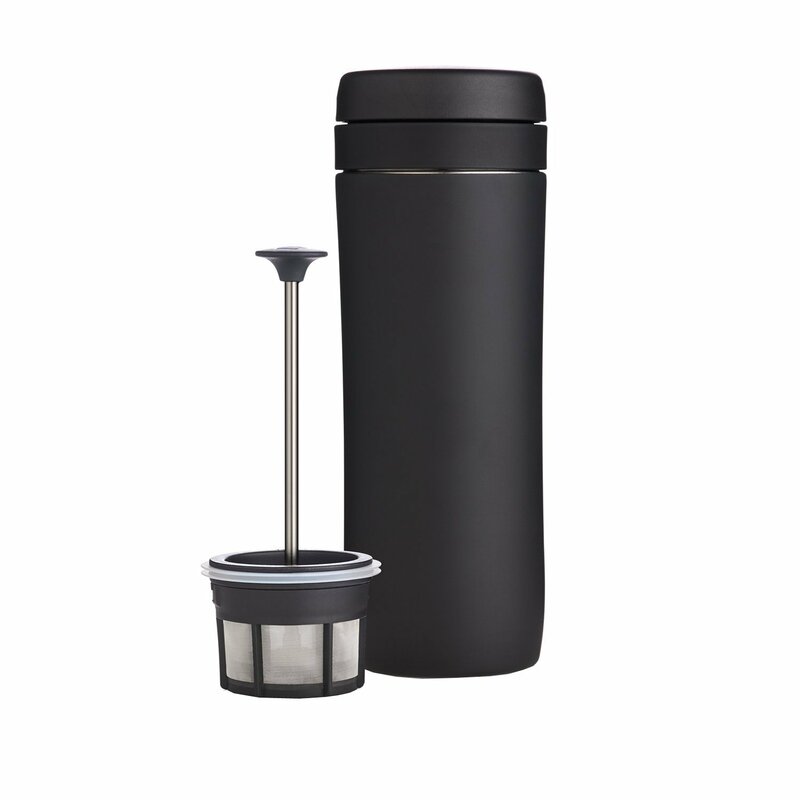 So, for now, this model remains one of those that you simply must try out if you’re looking for a French press travel mug. ZYLISS Travel French Press and Coffee Mug. This is one of those models that I’ve been waiting to write about. Honestly, I just love this model because of the way it looks. Take a look for yourself, this model just looks unique, doesn’t it? And guess what- it’s just as unique when it comes to functionality as well! This mug, to begin with (and once again) has a beautiful look. Besides that, it’s also a really handy model. It’s the ideal size for a single serving and just the right size to carry around with ease, making it a really great model that you might try out. Presse by bobble, On the Go Brewer is one of the models that’s just unique from every aspect. Be it looks, construction, or even just the name of the model! This is one of those models that are just unique in their own ways. The Presse by bobble boasts of a great insulation system that ensures that your drink is kept warm as long as it remains in the brewer, allowing you to just keep it in until you want to have a warm sip of coffee (or two!). At the same time, the model has a unique look, which makes it even more special. Overall, it’s a great model that you simply must give a shot if you’re ever in need of one! 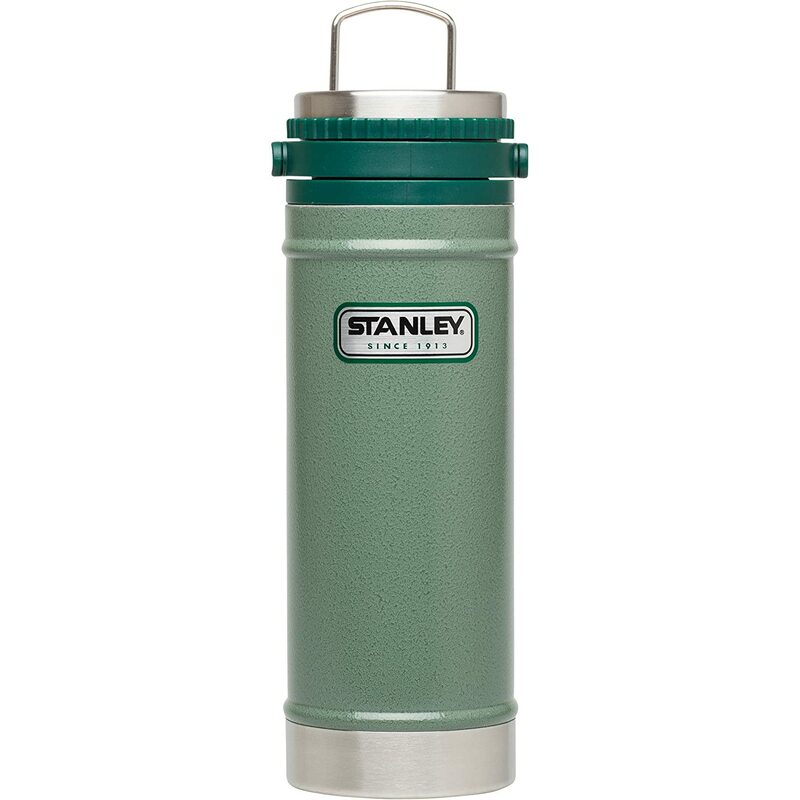 And let’s conclude this list with the Stanley Classic Vacuum Travel Press Mug. Now, I believe that some of you might have already heard of this mug. It’s actually a pretty famous model that all its users really seem to love, making it even more special. Coming to the features, this model is also vacuum insulated. That means that this model is able to keep your drink warm for a really long amount of time. This mug is also the right size for serving all your travel and storage(size) needs- 16 ounces. So, this mug is really suggested too! My Buyer’s Guide: What is the Difference Between All The Options? What’s the Most Important Thing to Consider? French press coffee mugs are designed to make single serving coffee. 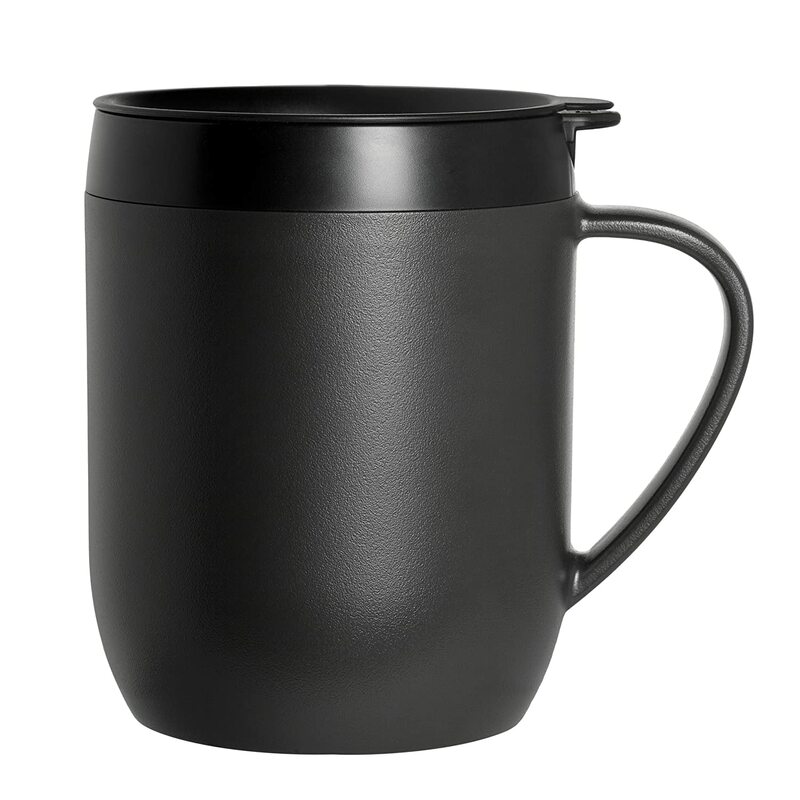 All the mugs featured on this page are insulated and because they are designed to incorporate a plunger to actually brew and filter the coffee most will hold less brewed coffee than stanard insulated travel mugs. When using a standard french press you will likely pour your coffee out of the press immediately after brewing into your mug. This prevents over-brewing or excess bitterness in your coffee. When you brew and drink from the same mug then you will have to either get used to drinking over-extracted coffee or spend enough money to get a mug that will better filter the grind and prevent back-flow of coffee into the pressed coffee grounds. Let’s consider a few of the most important preferences that you should consider. If you want your coffee to stay hot as long as possible then you need to opt for a vacuum insulated coffee press mug. The best performing option for thermal retention is the Espro Travel Press but all stainless steel vacuum insulated options will also do very well. If you care most about making great coffee in your mug/press combo unit then you have to choose one that uses a premium filter plunger. The two Espro models each use a double filtered plunger with a much finer mesh filter than is found in normal french press coffee makers. These plungers also give you the option of using an additional paper filter to prevent the fines from getting into the drinkable coffee. As an alternative the Kohipress uses an even fancier plunger mechanism that in designed with a one-way valve. As you press the plunger down the grind is filtered tot he bottom and the coffee goes up through the one-way valve. Once it is above the plunger valve it no longer comes in contact with the grind that was pressed out preventing the possibility of over-extraction no matter how much you shake the mug while in transit, hiking, or biking. Lastly, if you just want a basic mug that can also make coffee then you should know that all the lowest price options will be fine but some are simply better than others. Some of the cheaper mug-coffee presses are leak proof, some are spill resistant, some are more or less insulated, some use better filters than others. Whatever is more important to you needs to be what you focus on at the low end of the price scale. By now, you might have a lot of questions. This is natural. So, let us answer the most commonly asked questions here and if you still have something more that you need clarification with, don’t hesitate to contact us, alright? Why would I need a small French press coffee maker? Hmm, it’s a really great question. But frankly speaking, it’s dependent on one’s personal needs. 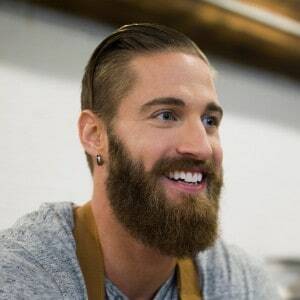 Someone might just be making some morning coffee or even just some coffee for themselves randomly and they might not be intending to drink ten glasses of coffee. For such a case, a small French press coffee maker is extremely useful. And the simple fact that there are so many models out there that are selling so many such machines makes it clear that there is obviously demand for it in the market. Except the capacity/size, not really. Cleaning may be a little different, since these do not separate as easily as non-travel counterparts. Well, in most of the cases here, it isn’t really too important because these machines aren’t too expensive. But of course, you must be aware about how much you can spend. You have to make a budget before you go out to buying anything if you don’t want to end up in serious trouble. So, you have to take care of that and buy a model that fits your budget. You must keep in mind that the best model for you isn’t always the best one available out there. The best model for you is the one that serves all your specific needs at the most affordable price and that’s one of the things that you simply must keep in mind when you go out looking for the right model for yourself. Finally, do know that Gamble Bay Coffee is here for you. We here at Gamble Bay Coffee try our best to bring you the right information to help you find the models that are the best for you. We hope that you could learn at least something new from your article that would help you do the same. Stay tuned for more great articles such as this one!